Sea hares are members of the class Gastropoda in the phylum Mollusca. 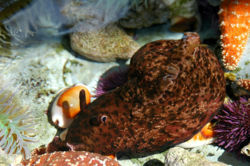 Known for their use of ink as a defense mechanism, sea hares are closely related to sea slugs and nudibranchs. They have numerous species, the most well known being Aplysia californica. Sea hares are found throughout the globe and are important to both the environment and scientific study. This is a sea hare (Aplysia kuroda) feeding on red algae. Sea hares receive their name from the pair of rhinophores on their head. These "ears" give the appearance of a rabbit, or hare, hence the name "Sea Hare." Along with the rhinophores, sea hares have two oral tentacles on either side of the mouth. Both the rhinophores and oral tentacles have nerve receptors that detect chemicals in the water and react to stimuli. The eyes of sea hares are simple, only able to detect light from dark. Most species have a thin, internal shell, protecting the gill and heart. The mantle cavity is covered by large flaps called parapodia. These are easily identified by the "ruffles" on the backs of sea hares. Sea hares are hermaphroditic, meaning that they are both male and female. In mating, three or more pile up into lines. Each sea hare is female to the one behind and male to the one in front. 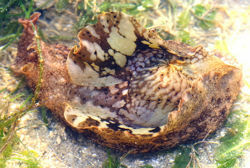 In this way, a sea hare breeds internally with two other sea hares at the same time. Once the eggs are fertilized, they are laid in long ribbons or masses, similar to strings of spaghetti. The species Aplysia californica can lay up to 86 million eggs during a single period. Sea hares are herbivores, feeding on various types of algae and eelgrass. As larvae, they eat primarily on red algae, transitioning to green and brown algae as they mature. Predators of sea hares include: Anthopleura xanthogrammica-- a large green sea anemone, Melo amphora-- a bailer shell (gastropod), Coscinasterias calamaria-- giant starfish, and humphead wrasse. If given the opportunity, many other animals will feed on sea hares as well. Most predators tend to prey on their egg masses more than anything. Favorinus japonicus, a nudibranch, especially feeds on sea hare egg masses. Pycnogonids, sea spiders, feed primarily on juvenile sea hares. What are sea hares? by W.B. Rudman. Sea Slug Forum. This page was last modified on 25 July 2014, at 10:47.